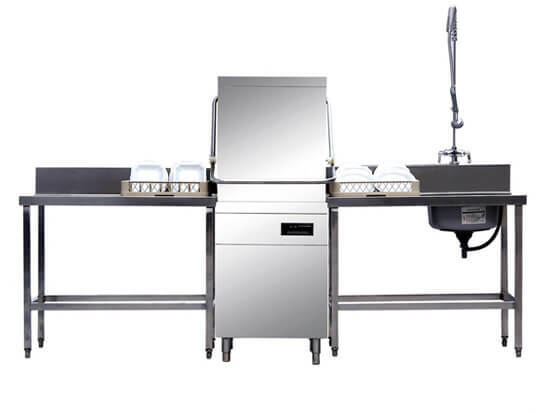 Amisy dishwasher/dishwashing machine can be largely applied in the households, restaurants, hotels and some other catering industries. The dishwasher can thoroughly clean, dry and disinfect the dishes. The dishes washed by Amisy washing machine look both clean and new, which will bring your customers and family a healthy and clean dining environment. Everyone likes delicious food, but washing up dishes can be a very daunting job for each householder and the dishwasher. It will cost us a lot of time to clean, scrub the greasy and dirty dishes, which will also waste a large amount of water. With the development of the social economy, people pay much attention to the work efficiency and the concept of time. Businessmen have to be faster than their competitors if they want to earn more at the same time. And housewives are also willing to have a good rest and enjoy other interesting entertainments instead of spending hours washing dishes in the kitchen. So, the dishwasher is the product of the social development, and it will become more and more popular in the future.